Electric material handlers offer several advantages, but there are several factors that must be taken into account. Most companies in the scrap and recycling business look for ways to improve efficiencies, lower costs at the yard and get a leg-up on their nearby friendly competition. One area of growing interest for lowering costs and increasing efficiencies at the yard is switching from diesel-powered to electric material handlers. And why not? There are significant long-term financial gains to be had by switching to an electric material handler. With diesel prices averaging around $4.00 per gallon and the typical charge per kilowatt hour of electricity below $0.15, costs for powering an electric handler can be less than half that of a traditional diesel machine. With all this said, there are many factors that must be considered prior to switching to an electric material handler in order to get the most from the machine. With mobility being limited, or non-existent, reach and capacity become more critical. An operation needs to consider how much of a reach will be required to minimize the number of times the material is handled. “Terex Fuchs offers a number of boom/stick configurations, with the MHL320 model offering a 31ft (9.5m) reach at the low end and the MHL385 handler offering a 75ft (22.9m) reach at the upper end,” says Brezinski. Finally, as part of the survey, you will want to do a cost-benefit analysis of the total investment to get the site ready to power an electric handler. “If a site has a shredder, then it will already have the power source on site,” comments Young. However, if the power infrastructure does not exist at the yard, then this will be an additional cost to the company. Once the site survey is complete and the right locations are selected for the new material handlers, then you are ready to reap some significant advantages of the alternate-fuel machines. First and foremost, exhaust emissions are eliminated. Eliminating the particulate emissions of the diesel engine is better for the environment, and it makes the operation friendlier to nearby neighbours. No-emissions operation is perfect for indoor recycling centres and transfer stations. It creates a healthier work environment for employees, and it can help the operation by meeting workplace health and safety legislation. Once the main electric motor is started, the handler is always ready for work. 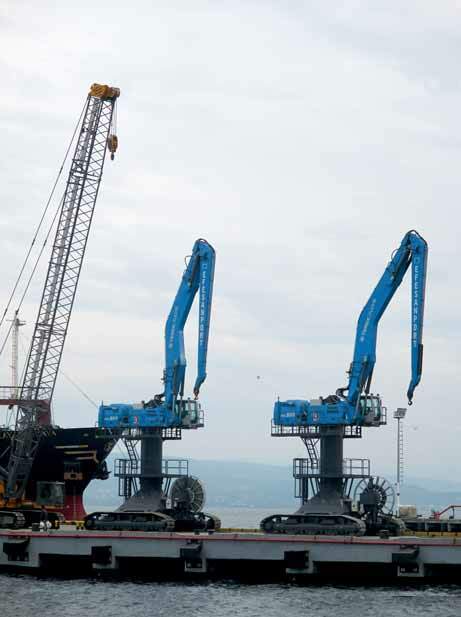 There is no downtime waiting for the machine to be fuelled, so there is better uptime availability. Electric handlers more efficiently use the available power than diesel engines. “Whereas diesel engines achieve approximately 30–40% available power utilization,” explains Berners, “electric motors deliver up to 90% efficiency.” Additionally, there is no regeneration downtime, common to some Tier 4 engine designs. Replacement of the diesel engine, cooling system and exhaust after treatment components with electric motors greatly simplifies maintenance needs for the handler and adds to machine uptime. Engine oil changes and filter replacements are no longer necessary. “For the most part, you just maintain the motor bearings with an electric handler. That’s it,” says Brezinski. Finally, don’t be afraid to work electric material handlers in the elements. They are designed to work in the same weather conditions — heat, rain, cold and snow — just like diesel models. Additionally,Terex Fuchs electric handlers come standard with a main power switch disconnect to safely service the machine. While similar in design to diesel machines, expect to pay a slight premium for a comparable electric handler model. Myslicki estimates about a 10–15% premium on average. “Depending on the configuration, it could be as low as 5–8%, but a pedestal machine will typically run about 10% higher and a mobile unit will be closer to 15% more,” he says. While sorting through many of the same considerations for purchasing the right diesel material handler for an application, selecting the right size, reach and model of electrical material handler takes some time and special scrutiny. Once an operation works through the cost-benefit analysis and all the necessary considerations with the equipment distributor and manufacturer, the electric material handler model selected can help to control long-term operating costs and increase efficiencies.